The Elastic-Back Circle Skirt Pattern was originally created because I wanted to adapt the NOT! For Knits Circle Skirt pattern for a variety of dolls, and while doing so realized that a historically accurate set-in waistband didn't work for dolls with hard bodies and protruding bellies. After some experimentation I did come up with a solution that satisfied me: a waistband that had a flat front for an authentic historical look, but an elasticized back for a good fit. 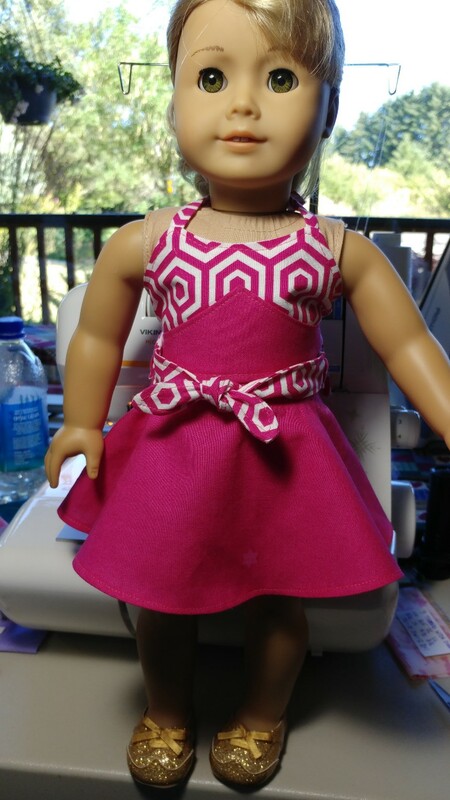 I also realized that a simpler construction technique could be used, and that the pattern draft also had the advantage of creating a universal fit for soft-bodied doll brands, whose lovable stuffed bodies can have widely varying measurements. Hence, the birth of the Elastic-Back Circle Skirt! The skirt features two lengths: a retro 1950's below-knee length and a modern above-the-knee length. An option for an attached petticoat is also included. 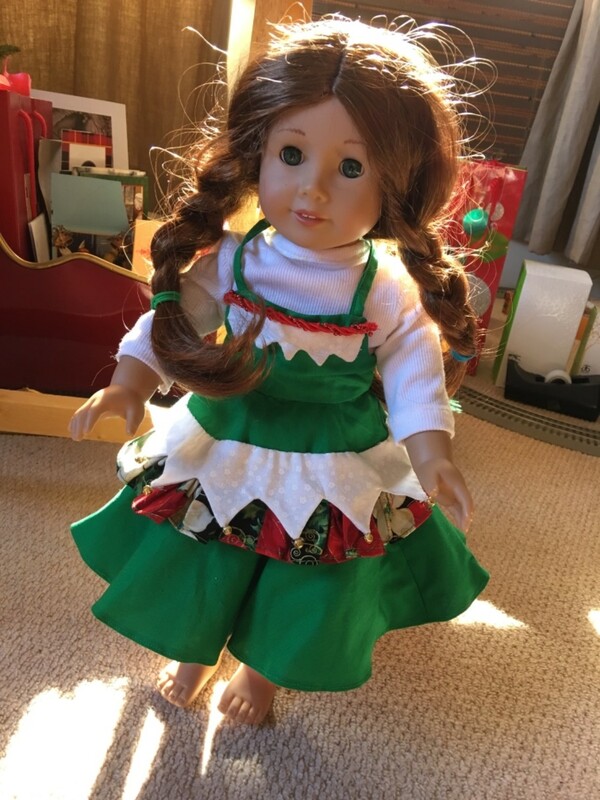 Little hands will be able to dress their doll independently without closures and never have to hunt for a lost petticoat! The skirt is also a great choice for newer seamstresses and craft fair sellers because of its simplicity, universal fit, and quick construction. And of course, historical purists and older children can always choose the option of the original NOT! For Knits Circle Skirt for an authentic miniaturized version of a classic circle skirt, a separate petticoat, and a skirt with a contemporary exposed elastic waistband! Looking for the cute wrap top shown with the skirt? Check out the Retro Wrap Top to complete the look. 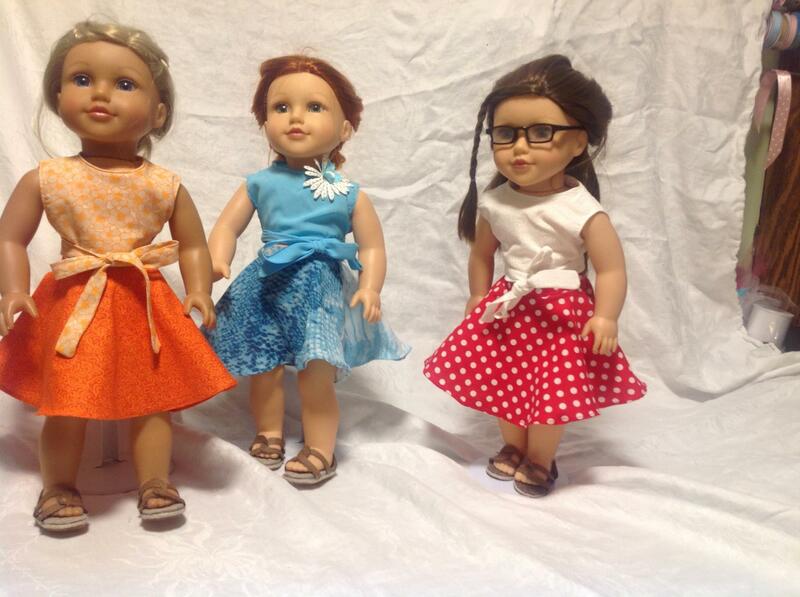 This pattern is also available for 18" Journey Girls® and 19" Gotz® dolls, as well as Kidz N Cats® dolls. Recommended Fabrics: For the main skirt: Light to medium-weight quilter's cottons (or other similar fabrics) depending on the which Option is chosen, and very lightweight fabric such as batiste or lawn for the Petticoat skirt. 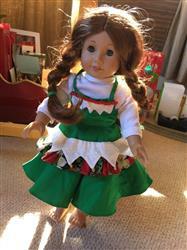 * If you have an older doll with a waist larger than 11" but with hips that are no wider than 12 - ½", cut your elastic 5" long (instead of 4 - ½"). It was very pretty with the sparkle crinoline. My granddaughter liked it I sent a picture with the apron earlier. Love this pattern. I wanted it to give it a try and then would like to make a poodle skirt for an American girl doll. Love that I can order, print, and cut out to sew right away. My granddaughter requested this skirt for her AG doll. . She wanted me to sew it with the Silver screen wrapped top. Then she chose the fabrics she wanted. Both patterns were fairly easy to sew. The directions were easy to read and both outfits turned out really cute. I just finished making this skirt and it is darling. Instructions were very easy to follow. I am now in the processor making the companion top.